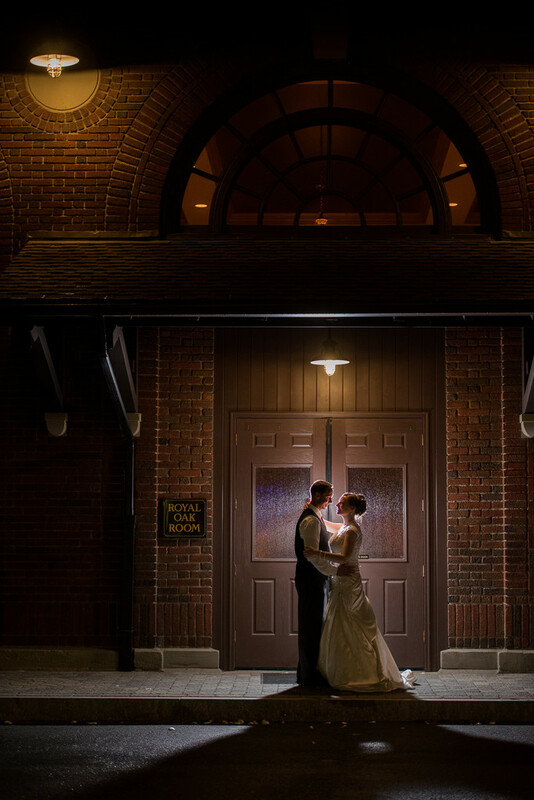 Lindsay and Todd were married at Bates Chapel in Auburn and then had their ceremony at the Royal Oak Room in Lewiston. I in this image I pulled Lindsay and Todd away from their party for some romantic couple’s images. As a wedding photographer I love creating these creative romantic shots of just the bride and groom in private. They enjoyed having the alone time and escaping the heat in the dance party in the room just beyond those doors. I love this image from the Royal Oak Room as it captures the couple on their special day but also shows the venue and the interesting antiquities of the building. Moody and romantic all the way. Location: Royal Oak Room, 1 Bates St, Lewiston, ME 04240.